Belvoir presents, ONCE IN ROYAL DAVID'S CITY by Michael Gow, in the Upstairs Theatre, at the Belvoir St Theatre, Surry Hills. ONCE IN ROYAL DAVID'S CITY by Michael Gow is having its world premiere at the Belvoir St Theatre. Upstairs, not Downstairs, for this new work. It is, indeed, a welcome experience to have a new Australian play without any of the obvious trappings, or artistic reputation, of past writers wreathing its conception and promise, on stage, at Belvoir (the usual 'game' is coming back, it seems, from what one has read, with the Simon Stone upcoming production of Gogol's THE GOVERNMENT INSPECTOR. How is it billed, After Gogol or ...?). Michael Gow's reputation as a writer, it seems, is enough of a marketing attraction to create interest for ticket buyers. This is the first play written by Mr Gow since 2007, the last, another world premiere: TOY SYMPHONY, also at Belvoir. That play/production won many awards: Helpmann Award: Best New Australian Work, 2008, and, for the Sydney Theatre Awards in 2007: Best Main Stage Production, Best Supporting Actress - Monica Maugham, Best New Work, Best Director - Neil Armfield and Best Actor - Richard Roxburgh. Will Drummond is bewildered. All the old certainties are coming apart. When he finds himself sitting by his mother's bedside in a hospital room on the north coast of New South Wales, suddenly he's faced with the mortality of loved ones, faced with the state of the world as it was and as it is right now. Set adrift, Will considers loss and what's left, class and contradiction, and navigating a corporatised and globalised world alone. In two of Mr Gow's plays, FURIOUS (1991) and TOY SYMPHONY (2007), the central figure is Roland Henning, and there has been some speculation as to the auto-biographical consistencies , especially in the later play, to the writer himself, (the first dictate in a manual to writing, maybe : "Write what you know"). Too, there is a sense of the auto-biography about Will Drummond emanating from this text, even if it were only within the cultural playing field of the 'grumpy old man' syndrome (!). Much of what Mr Drummond says, questions, believes, in ONCE IN ROYAL DAVID'S CITY seemed to resonate, passionately and humorously, for a certain generation demographic in the audience - many having the visible delineation of the same aging process as the program's photographs of the author at work. Will Drummond could just as interestingly, more interestingly, perhaps, have been another incarnation of Roland Henning - they, both, certainly, among other traits, have the same displayed, uncomfortable, expressions of sexual preferences - or am I just being too politically sensitive? A Trilogy: The Roland Henning plays! The text is basically an extended monologue ("aria") for the central character, Will Drummond, a theatre director (Brendan Cowell), with only sketched in others-of-his-world, to explicate the dramatisation of some of the situations he encounters in his re-called, enacted, recent life journey. It is the same dramatic/literary conceit employed by Mr Gow in TOY SYMPHONY, without the recipe ingredient of the fantasy figures that Roland conjured up in his dilemma with writer's block. 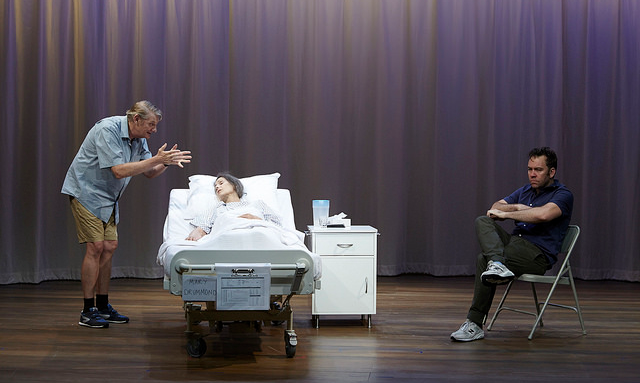 As it was then, with TOY SYMPHONY, there is no real set design required (Set and Lighting Design by Nick Schlieper), but for the functional 'symbols' - representations of necessity - a circular, hand pulled curtain to divide scenes in time, and to allow the pragmatic exit and entrance of furniture - hospital bed, chairs etc. - that are necessary, minimally, for the action to take place - a technique familiar to the Director, Eamon Flack, which was felicitously utilised in his fluid production of Tony Kushner's ANGELS IN AMERICA, last year. The actors, are simply, but deftly, costumed with minimal, but telling, changes (sometimes props) to create different character personas as are fleetingly necessary (Costume Design by Mel Page). The actors sit on the upper edges of the stage, sometimes, in a kind of gestural reference to some of the Myerhold and Brecht experiments in presenting theatre -" you are at a play", "you are in a theatre", "we are playing -this is not real", "you see us and we can see you", "think, as well as feel" "watch us watch the play with you" etc. It is, of course a tradition that goes as far back as Shakespeare. ... And make imaginary puissance; ..." etc. Oh, for a muse of fire, indeed. The company of supporting actors are, within the limitations of the opportunities in the writing, extremely adept. Immaculate, really. All playing more than one responsibility: Maggie Dence, Tara Morice, Helen Buday, Lech Mackiewicz, Harry Greenwood, Anthony Phelan. But, especially, Helen Morse as Jeannie, Will's mum. Ms Morse kicks off the play with two 'arias' of text with which she creates a life and world of striking 3D dimension and depths - one feels so secure, so comfortable in the technical and imaginative skills, forces, of this actress, that it is cumulatively regretful, as the play moves on, that she spends a lot of the rest of her stage time comatosed in a hospitable bed (even that is arresting!). One longs to see this actress at work more often (who can forget Ms Morse's performance in the recent Fred Schepisi film of Patrick White's novel, THE EYE OF THE STORM, as the tragic Lotte?). Brendan Cowell, as Will Drummond, has all the energy and athletic drive of a leading actor (so much so, that he, quickly, soaks, literally, the back of his shirt with the sweat of the efforts) as the storyteller of this tale. Along with his actor's intelligence and a growing discipline of craft techniques ( although the voice tends to fray, with the demands asked of it, by Mr Gow, and made on it, by Mr Cowell - "yelling", did I read? ), harnessed to clever physical observational characteristics - hands, wrists, for instance. Much is employed, deployed, to perpetrate a man that we can recognise. It is, mostly, impressive. What it ultimately lacked, as one watched for the reveal, reveals, from this actor, was the inner grief, secret, of the man to be fearlessly shown - those personal moments - that can clue an audience to 'read', to find the depths of the character/the man, and not just have to deal with the surfaces of externalised characteristics, as a key to the truths of the actions. It does require, as I have discussed, in my recent blog on THE LONG WAY HOME, a fearless use of personalisation, raw identification of an actor's truth, to convince us of the core agency driving the character. The cross over contact between the actor and the character, that, with the act of imagination, creates an indelibly great moment(s) for the audience. It requires real courage to give this gift of the sublime 'mystery' of the actor at work - it is a costly offer that the artist is asked to give, but we, as an active role player, a present player/actor in the magic of the theatre give-and take between 'artists', are searching, unconsciously, searching for it.The actor is our surrogate 'expressor' of our own joys and pains - it is to him/her we are relying on, to give us a catharsis to help us learn about living and be able to go on. It is why the theatre and sport are necessary health filled experiences. We 'ordinary', are witnessing the 'extraordinary', the storytellers of our tribe, in this instance of our social culture, to help us to understand: "Why is it so?" Why is life like this? Why? And, I am not alone? Am I? Ms Morse does it, in the presence of her Jeannie, both her body, and especially her voice, resonating with a deep and complicated inner history of both joys and pains that support her textural givings, devastatingly. Matthew McConaughey and Jared Leto are shockingly consistent with this power of revelation (and not because of the weight losses, was I moved - I don't ethically, understand or agree with those choices - isn't there such a thing as CGI these days?) many, many times in the film, DALLAS BUYERS CLUB, (and, up till now, I was never a fan of Mr McConaughey's work. The WOLF OF WALL STREET cameo, is just as interesting). Cate Blanchett does it with her BLUE JASMINE, too. Mr Gow, even, provides an opportunity, written into the play, towards the end of the last speech: Will, "He stops. Some emotion has taken away his voice. He lets it subside and goes on." At the performance, I saw, this moment was given technically by Mr Cowell, 'acted', it was not a reveal of an actor's known truth. So, I admired the performance, but was not moved by it. Disappointed by it, really. It was a dazzling technical act of bravura, 'physically' effortful, for sure, but always, on the rim, tantalisingly, on the edge, teetering on the possibility of greatness , but, for whatever obstacle was blocking him, he withheld, not plundering into the abyss of an indelible truth. Withheld when it was asked of him by the writer, and looked for by us : the ultimate sacrifice of the actor, of himself. A self sacrifice - the real self, in that moment - on the altar of Thespis. Eamon Flack with this work on ONCE IN ROYAL DAVID'S CITY, re-iterates his growing artistry. More 'power' to him. All in all, though, the play is not representative of this writer at his best. Still, for the regular theatre goer worth seeing, just for that very reason of debatable comparison, and/or to see an authentic, original, new Australian play text at Belvoir. Wholeheartedly welcomed by me. The wearying didacticism of Mr Gow's furious Will Drummond, throughout the play, however, evoked from the woman behind me, after Professor Julius Sumner Miller, finished his TV experiment demonstration, at the end of the play and Will re-iterated "Why. Is it so? Thank you for listening." : "Class dismissed." Her friend apologised to her, as we were leaving, for encouraging her to come to see the play. Others, I do report, at the curtain call, felt otherwise. Oscar Wilde's THE IMPORTANCE OF BEING EARNEST is sub-titled, famously as: A Trivial Comedy for Serious people, a scene of which Mr Gow introduces in one of his episodes in ONCE IN ROYAL DAVID'S CITY. ONCE IN ROYAL DAVID'S CITY could be sub-titled: A Serious Comedy for Trivial People.